From figurative painting, collage and installation to illustration and award winning picture-books, Oliver Jeffers practice takes many forms. His distinctive paintings have been exhibited in multiple cities, including the National Portrait Gallery in London and the Brooklyn Museum New York. 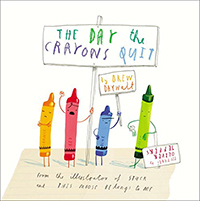 HarperCollins UK and Penguin USA publish his picture books, now translated into over 36 languages, including The Incredible Book Eating Boy, and the New York Times Bestseller This Moose Belongs to Me and #1 New York Times Bestseller The Day The Crayons Quit. Oliver won an Emmy in 2010 for his collaborative work with artist and filmmaker Mac Premo. He has made art for Newsweek, The New York Times, United Airlines, TED, Nintendo, and has illustrated a a number of novels.